It seems like every time we turn around, another cable is falling apart -- not really falling apart, but the covering is cracking and now the cable can bend and soon the wires are exposed and breaking and then the cable has to be replaced. In our home of the thousand cables, it happens far too often. I cannot blame Apple for this. we simply abuse our cables, bending, stretching them and even letting them lie on the floor. Over the years I have tried a bit of everything to solve the cracking problem but most of my attempts have been less than successful. Adhesive tape, masking tape, and medical tape cover the area, but the damage continues. Last year I heard about a new product, X-Treme Tape by Mocap. Of course, it was not available in my local stores, so to Amazon I went. At that time, I could only find the black version, but I bought a roll to try. Unfortunately, I forgot to take a picture of what the repaired cable looked like after a year before I replaced the tape again, but it had held up very well. Ron's Lightning Cable had also begun to crack, so it was time to grab the tape and do another repair. I cut another piece of tape, actually two and wrapped It around the cable. The interesting thing is that the tape is not sticky until you stretch it, so you begin by wrapping the tape around until it touches itself and then you begin stretching. The more you stretch, the stickier it gets. I began my wrap as close to the plug as possible, and then I wrapped another piece of tape below it. The tape takes 24 hours to completely cure, but this is how the cable looks. If my experience is the same as last time, this repair will last about a year and the cable will not continue to degrade in that time. 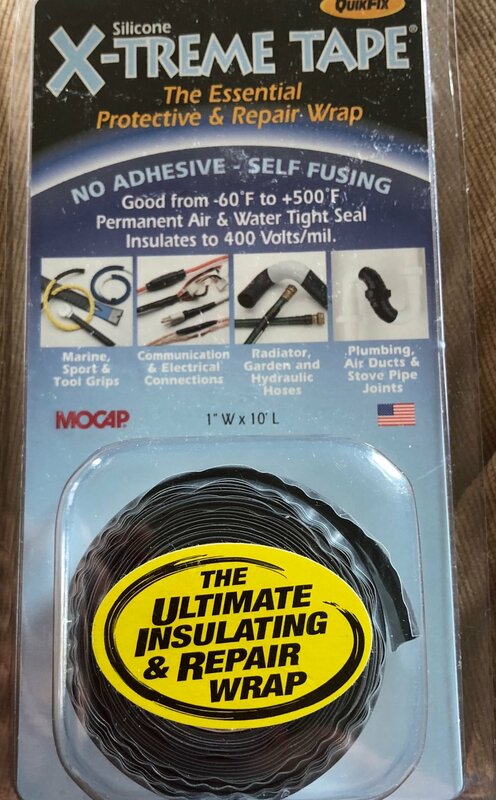 We have not used the tape for any other repairs around our home, but I would expect it to work well in the other uses identified on the packaging. Of course, that means I have a whole roll of black tape, and I would probably prefer the white or colored version. I may have to be more aggressive in finding uses for this tape so I can justify adding to my collection. The roll of tape cost me less than $10.00 A new cable from Apple begins at $19.00. The tape for the win! The obvious question is why would I pay for Apple cables? In my experience, over the years, most off-brand cables that you can easily buy do not hold up as well as Apple cables and they are often identified as being the culprits in fires involving charging devices. While there are some cables that my be better, you will have to order them online or go to a specialty store, so Apple cables from the Apple store are my first choice.